Lock in a great price for Dorkas – rated 9.2 by recent guests! The staff were very friendly. They brought our breakfast in our room on 2 occasions, which was great. The hotel is very well located at a less than 10 minute walk from the harbour (where the ferry arrives) and a 1 minute walk from the sea. The beach next to the hotel is very nice with trees so that it is always possible to sit in the shade. The airco in the room worked very well. Very close to town but a little difficult to find. The owner should put up a few small signs indicating the direction to and location of the hotel. A lovely location slightly back from a good beach . Close to the main port but quiet. Our room was nice with a sea view from the large private terrace (not all rooms have this) although the mattress could have been a bit better. The owners picked us up and dropped us back to the ferry. We didn't have breakfast so can't comment on this. Very nice location, close to the beach and to the center! Cleanness was superb!! Big room, nice decoration and amazing seaview. The manager was very helpful! I recommend it! Great location, only a minute from the beach. Big terrace with some sea view. The hosts were really kind, arranging a rental car and providing free shuttle to the ferry. I would happily return to Dorkas! we had the room with sea view and a large balcony. the breakfast was delicious, a mix of ham, cheese , olive plum tomatoes, fresh fruits, Greek yogurt and jams. Great location, 5 min from one of the beaches and to the harbour where the night life is. The hosts were lovely and very flexible. we liked it so much we stayed an extra night! Very friendly staff and very well organised. The accomodation is very clean .The owner is extremely helpful and i strongly recommend it to others. Well done and congratulations for their professionalism. The bed was comfortable and the room was spacious enough for 2 people. The beach is really close by and the port is a 5 minute walk. If you go by car is it a bit farther away because there are one-way roads in the area. The owner is super helpful and very friendly. She also provided us with an early check-in. We spent one wonderful week in Serifos and Dorkas was the perfect home away from home. The manager, Angela, and the staff were nice and caring, the room was comfortable and clean. Livadakia beach is only a few meters away. The hotel is near to Livadi port but still really quiet. The location is amazing, only a 2 minute walk to the beach. Rooms are super clean and the staff is very helpful. The complementary shuttle to the port was a nice touch! 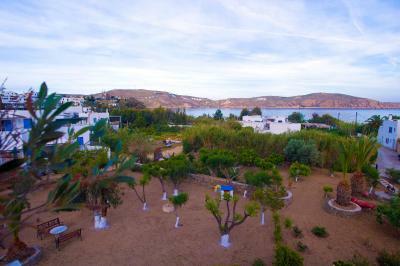 Offering a sun terrace and garden, Dorkas is 100 feet from the beach of Livadakia in Serifos. Some rooms include a balcony overlooking the Aegean Sea. The property is 1,650 feet from restaurants and cafeterias. Each of the air-conditioned rooms features free Wi-Fi, a TV and fridge. The bathroom comes with a shower, hairdryer and free toiletries. Dorkas is 1.9 mi from Chora, with its castle ruins and the Archaeological and Folklore Museums. The port is 1,650 feet away. When would you like to stay at Dorkas? Offering a shared terrace, the air-conditioned room features free Wi-Fi and a TV. The bathroom comes with a shower, hairdryer and free toiletries. Offering a balcony, the air-conditioned room includes free Wi-Fi and a TV. The bathroom comes with a shower, hairdryer and free toiletries. Offering a balcony overlooking the Aegean Sea, the air-conditioned room features free Wi-Fi and a TV. The bathroom comes with a shower, hairdryer and free toiletries. House Rules Dorkas takes special requests – add in the next step! Dorkas accepts these cards and reserves the right to temporarily hold an amount prior to arrival. In case you wish to use the free port shuttle, please notify the property 1 day in advance. Treatment received by person who serves breakfast, who hardly speaks English and was a bit stressed and rude when we asked if possible to have vegetal milk. In addition, the room was not cleaned on our second day. The hotel is on the road so if you are a light sleeper you will definitely need ear plugs. The bathroom was very small and the shower didn't close properly so that there was water all over the bathroom after showering. A wonderful place to spend your vacations! A very nice place, with wonderful garden really close to the beach! The beach is wonderful and very clean! The room was amazing, clean and renovated. A delicious breakfast! One of the most tasty breakfast in the whole Cyclades during our trip. Congrats to Angela! Good location, near to port and beach but also quiet. Nice outlook towards the bay.